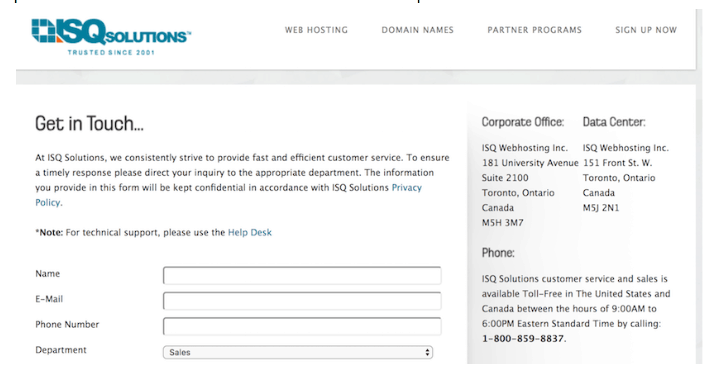 ISQ Solutions Review 2019: Is ISQ Solutions a Good Hosting? Founded in 2001, ISQ Solutions offers two levels of shared Windows hosting on a cloud platform. Its server center in Toronto, Canada is connected to an important North American internet hub and its website is in English. Founded in 2001, ISQ Solutions is an award-winning provider of shared Windows web hosting and domain registration based in Toronto, Canada. Its data center is housed in Toronto in one of the largest internet access points in North America. Hosting plans use ISQ Solutions’ cloud platform for flexibility and scalability. The ISQ Solutions value plan and business plan both have the same set of basic features while they vary in their data allowances and one or two other aspects. The value plan comes with 2,000MB of cloud storage, 100GB of burstable data transfer, and 1GB of email storage. The business plan increases these amounts of data to 5,000MB of cloud storage, unlimited data transfer, 2GB of cloud email storage. 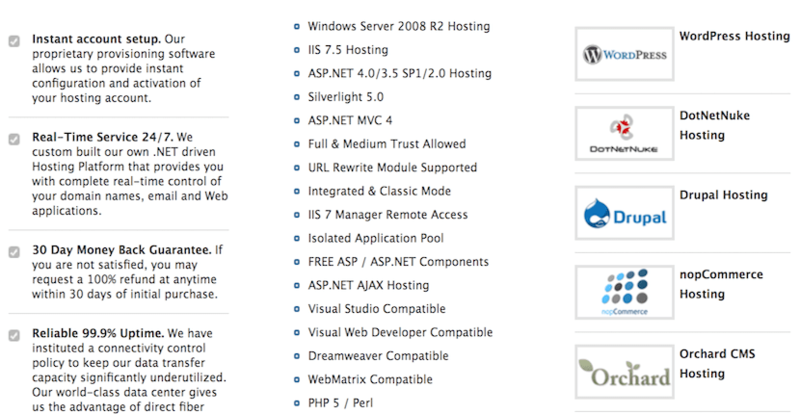 Both plans feature: ASP.NET 4.5, MVC 4, Silverlight 5, PHP 5, and MySQL 5. The business plan lets customers opt for SQL 2008 instead of MySQL 5 if they desire. For ISQ Solutions customers, MerchantSecure shared SSL certificates from Geotrust are available at an additional cost. These are standard 128-bit encrypted certificates enabling your website to appear with “https.” Private SSL certificates are allowed as well. Customers can have their own third-party certificate installed by customer support via the help desk. The data center where ISQ Solutions houses its servers is located in Canada’s most connected telecommunications building, which houses over 150 telecom companies. This building has nine different fiber optic networks and 7,000 strands of fiber. Security is provided round-the-clock and fire and water suppression systems are in place along with backup fuel generators. All of these precautions are there to ensure a near constant server uptime of 99.9%. Pricing for ISQ Solutions’ shared hosting plans is fair. It offers different billing cycle lengths depending on customer preference and a three-month discount is applied to annual contracts. For monthly billing, the value plan price is similar or lower than monthly plans from top North American providers, while the monthly business plan price is a little higher than average. These plans become more competitively priced when an annual plan is chosen and customers are in essence only paying for nine of those 12 months. This brings ISQ Solutions’ prices to a very competitive level and in line with other top hosting providers. Payment for plans can be made 24-hours a day on the website via credit card or PayPal. For customer service, toll-free phone support in the U.S. and Canada is available from 9:00 a.m to 6:00 p.m. EST. Ticketed technical support can be accessed 24/7 via the helpdesk, which also features a knowledge base and tutorials. I reached out to support during the evening with a sales query via the online form. Unfortunately, I did not receive any response. ISQ Solutions offers two levels of shared Windows hosting on its cloud platform based in Toronto, Canada. Its value and business plans are fairly priced and worth considering. Wondering how ISQ Solutions stacks up against other Web Hosting companies? Enter any other Web Hosting company and we will give you a side-by-side comparison.